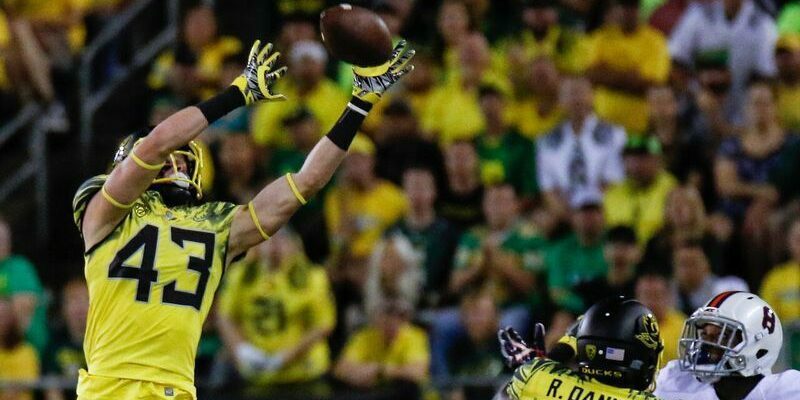 A trendy criticism of the Oregon Ducks is their defense – or lack of it. When fans take a look at the field Saturday they may notice that defensive coordinator Brady Hoke‘s defense will feature only one senior in the starting lineup. Yes, the mistake-prone defense is experiencing some growing pains. That is easy to see, but better days are coming on that side of the ball. For proof, look no further than freshman starting safety Brenden Schooler. Brenden Schooler makes the tackle for Ducks. The long-haired Californian has played in all four games this season, making his debut playing special teams against UC-Davis before suiting up at safety against Virginia. He did not waste the opportunity. Late in the second quarter he intercepted a pass that led to a Ducks’ touchdown just before halftime. As secondary coach John Neal told Andrew Grief of The Oregonian, “We’ve got what we hope is a very special player.” He went on to praise Schooler’s ball and tackling skills. Quite an compliment for a former two-star recruit who did not receive offers from any other Pac-12 schools. The journey that brought Schooler to Oregon could only be described as unconventional. Schooler, the son of Mission Viejo defensive line coach Tom Schooler, played for four different high schools in four years. Despite a strong senior year during which he accounted for 91 tackles, 3 interceptions, 3 blocked punts and 2 blocked field goals, there was only 1 scholarship offer – and the all-State defensive player with 10.76–second 100-meter speed turned it down. The lack of interest in him as a recruit has served as motivation. 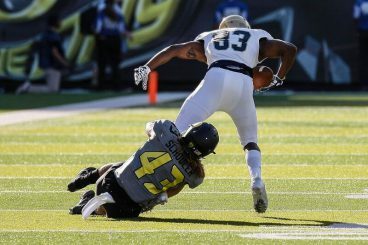 He told Ryan Thorburn of the The Register Guard, “It definitely fueled the fire in me to come out and prove that I deserve to be here.” While many premier freshmen who hope to see the field quickly enroll in school to take part in spring practices, Schooler was not even offered a scholarship to play for the Ducks until June. It would seem only natural for Schooler then to redshirt, but that was not the case. Watching highlights of Schooler from high school shows a smart and energetic player who puts maximum effort into every play. Schooler has 2 interceptions in the first 4 games. Schooler’s interception last week against Colorado certainly shows his potential. If not for a complete lapse of judgment offensively in the final seconds, Schooler’s interception might have been seen as a game-changing moment. Schooler used his 6’2-inch frame to elevate and steal the ball away from the waiting wide receiver. He maintained his balance and returned it 36 yards to set up a touchdown for the Ducks. Just four games into his time in Tracktown, USA, Schooler has made an impression. He has 17 total tackles and his 2 interceptions lead the team. 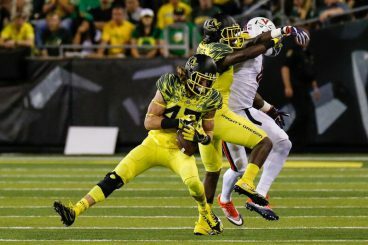 As the Ducks’ season teeters on the brink, it is becoming clear that youth is the strength of the Oregon defense, and they are moving in the right direction.